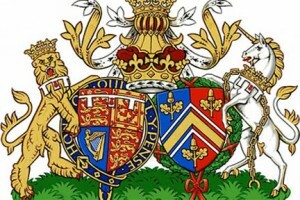 I was recently asked, if I could foresee which coat of arms will fly high on the British Monarchy! I explained to a friend that Prince George, son of William and Catherine, Duke and Duchess of Cambridge; who is born on July 22, 2013, and he is now 11 months of age, would be 72 years old once he naturally would take on the Throne of England. His Coat of Arm will fly high! How did I estimate that age? The answer lay within the past of British history. First, I would like to give credit to The College of Arms, in London, England, for creating such a beautiful Coat of Arms, conjugal arms of William’s coat of arms on the left, and Catherine Middleton’s shield on the right, of a royal husband and wife, side by side. This coat of arms was approved by the Queen on Friday, September 27, 2013, to be granted, to Duke and Duchess of Cambridge. William received his coat of arms when he turned 18. Catherin’s family coat of arms was granted in 2011 before the wedding. The royal wedding was held on April 29, 2011. As we all know, the bloodline and of the Mountbatten-Windsor family is a healthy one. Longevity and healthy lifestyles with prayers for long life have graced the kingdom! Queen Mother, mother of our present Queen Elizabeth of England, lived to be 102 of age. Queen Mother whose full name is Elizabeth Angela Marguerite Bowes-Lyon was born August 4, 1900. Her father Claude George Bowes-Lyon, 14th Earl of Strathmore and Kinghorne, was a landowner. He was born on March 14, 1855, Chelsea, London, United Kingdom. He died on November 7, 1944. He lived to be 89 years of age. His wife, Cecilia Nina Bowes-Lyon, Countess of Strathmore and Kinghorne, née Cavendish-Bentinck, was the mother of Elizabeth Angela Marguerite Bowes-Lyon and maternal grand-mother and godmother of Elizabeth II, our present day Queen of England. Cecilia Nina Bowes-Lyon was born September 11, 1862, Belgravia, London, United Kingdom. She diedonJune 23, 1938, London, England. She lived to be 76 years old. Even Cecilia’s mother lived to be 86 and her father 52. Those were good ages for the time they lived. Our Queen Elizabeth II has a good lineage on her mother side of the family and her father, George VI was King of the United Kingdom and the Dominions of the British Commonwealth from 11 December 1936 until his death on February 6, 1952. He lived to be 57 years old. He died in his sleep. Accordingly George VI mother Mary of Teck was Queen of the United Kingdom and the British Dominions, and Empress of India, as the wife of King-Emperor George V. Mary Teck was born on May 26, 1867 and died March 24, 1953. She lived to be 86 years of age. George’s father George V was King of the United Kingdom and the British Dominions, and Emperor of India, from 6 May 1910 until his death, was born June 3, 1865 and died on January 20, 1936. King George V lived to be 71. As we see Queen Elizabeth II has a strong lineage and will live to be as old as her mother, the late Queen Mother. With that said, the monarchy will get a late start for all who are in line to become the next symbolic King of England. Queen Elizabeth married Prince Philip Mountbatten, Duke of Edinburgh in 1947. Prince Phillip was (born Prince Philip of Greece and Denmark). Before he married Elizabeth II, he renounced his Greek and Danish titles, converted from Greek Orthodox to Anglicanism. He also adopted the style Lieutenant Phillip Mountbatten, taken the surname of his mother’s family Battenberg in the World War I, changed it to Mountbatten, because of rising anti-German sentiment among the British public. On July 14, 1917, Prince Louis of Battenberg, Prince Phillip’s grand-father, assumed the surname Mountbatten. Just before the wedding King George VI granted him the title of Duke of Edinburgh and granted the style His Royal Highness. Prince Phillip is the longest-serving, oldest-ever spouse of a reigning British monarch, and the oldest-ever male member of the British royal family. He is born June 10, 1921, age 92. Long live Prince Phillip! Prince Phillip equally comes from a royal linage. His father, Prince Andrew of Greece and Denmark of the House of Schleswig-Holstein-Sonderburg-Glücksburg, was the seventh child and fourth son of King George I of Greece and Olga Constantinovna of Russia. Prince Andrew was born on February 2, 1882, in Athens, Greece. He died December 3, 1944, at the age of 62. Prince Philip’s mother was the late Princess Alice of Battenberg. She was by birth of the House of Battenberg. Born February 25, 1885, and died December 5, 1969, at age 84. Prince Phillip also comes from a strong lineage and in turn his children, as well as his grand-children will live long happy lives. Queen Elizabeth will rain another 14 years, thereafter, Prince Charles will be of a mature age of 79, he will rain 23 years in good health. Then it will be Prince William’s turn by then he will be 68 years of age. William will rain 34 years. Unless Prince Charles abdicates! In that case, Prince William will get a head start in life and becomes the King of England by age 45 and will rain for 57 years on “the empire on which the sun never sets”. In conclusion, if everyone in the line of the throne proceeds as natural, by the time Prince George, born July 22, 2013, will rain over the United Kingdom, in the year 2085, he will be 72 years of age. History will record the three generations of British Kings. The only time this might change is when Prince George will have his first born to be a daughter. Then it will go back to British Queens, as it is today where Long Live Queen Elizabeth II reins over England. At that time, I will not be around to write a sequel to this blog! For creative blogging or content management, please contact me at: info@seo-social-marketing.com.